This post may contain affiliate links. Visit my disclaimer page for more info. I’ve spent the past few years on a complete life transformation journey, with decluttering + down-sizing (moving from a 5 bed, 2.5 bath, 3200 sq ft house to a 2 bed, 1 bath, 750 sq ft house), becoming debt free (paying off $490k of debt to now cash-flowing vehicles), stepping up my spiritual + mental health (from anxious + depressed to Bible reading + counseling), all while Homeschooling our 3 daughters, coaching in my online Budgeting Course, motivating thousands of women every week on A Sunny Side Up Life Podcast, + continuing to be a loving wife to my husband of 10 years. In 2016 I declared it would be my Year of Less and we decluttered + knocked out debt like there was no tomorrow! …and now in 2019, I’m declaring this to be my Year of Trust where I plan to stop letting fear of failure and the unknown, as well as self-doubt, hold me back from what I know is my true potential. Yep! My life is pretty full, but these past few years since I’ve started being more intentional it hasn’t really seemed that hard, because I’ve actually been focusing on the things that matter most and, in the words of Lara Casey, I’ve been “cultivating what matters”. I’m sharing below the break down of my 2019 goals and how I plan to take my fears + self-doubt and flip them into a cultivated life full of faith + trust. Before I dig into my goals in detail, you should know that I kind of have a secret weapon when it comes to goal-setting…it’s The Powersheets! You can learn more about them in the resources linked below, but in short, The Powersheets are an intentional goal planner that help you dig into your biggest dreams and turn them into simple actionable goals. In the first section of The Powersheets I dug into things like: discovering who I really am, letting go of my past, meeting my fears head on, + focusing on what truly fires me up about my life. These sections were hard, I’m not going to sugar-coat that, but I knew that they were such a necessary part of the goal-setting process. And, even though I had to take lots of breaks in between prompts for my sanity’s sake, I still kept pushing forward even when it got hard. As I waded through the mud + the muck that is the inside of my brain (#mombrain of almost 8 years), I noticed that I kept writing the words “fear”, “doubt”, “anxious”, + “unknown”. Ugh! Those are some big scary words, aren’t they!? I saw this trend emerging so I Google searched for antonyms of these words. Every. Single. Word. TRUST was an antonym to them! And that’s where my Year of Trust began! I knew that in order to overcome all of the things that I felt like had been holding me back I HAD to do the opposite! I wrote, “My word for this year is trust because I don’t want to let the unknown control me. I will live by saying yes to believing in myself + having faith, and by saying no to anxiety + fear.”. …and the rest is goal-setting history! This fear comes from a place of worrying that I’ll out-live my husband, my daughters will all be grown + have their own lives, and then I’ll have nothing left. I have this overwhelming fear that if I don’t cultivate my own identity outside of my roles as a wife + a mother that one day I’ll wake up and have no real life of my own. This fear comes from feeling like the person I want to be, the goals I want to achieve, + the potential I want to reach are too far out of reach and therefore not realistically possible. This fear comes as a remnant of the struggles I had in 2018 with my anxiety + depression getting to an overwhelming point that it took a physical toll on my body in the way of exhaustion + constant pain in my neck/ left shoulder. This fear comes from the overwhelming fact that as a wife, mother, + homeschool teacher I carry so much of the family responsibility on my shoulders at all times, and knowing that if I fail that I will let down my husband + my daughters. This fear comes from a place of doubting our ability to retire Daniel at a young age from his off-shore job that keeps him away from home half of the year. It also comes from a place of doubting my ability to work from home successfully. As well as, doubting my ability to continue homeschooling our girls throughout high school. In other words, this is about me doubting that we’ll ever get to spend every single day together with Daniel home from the water, me working from home, + the girls doing school at home. This fear comes from worrying that we will slip back into our old ways of handling our money, that we’ll get lazy, or somehow lose everything that we’ve worked so hard for. 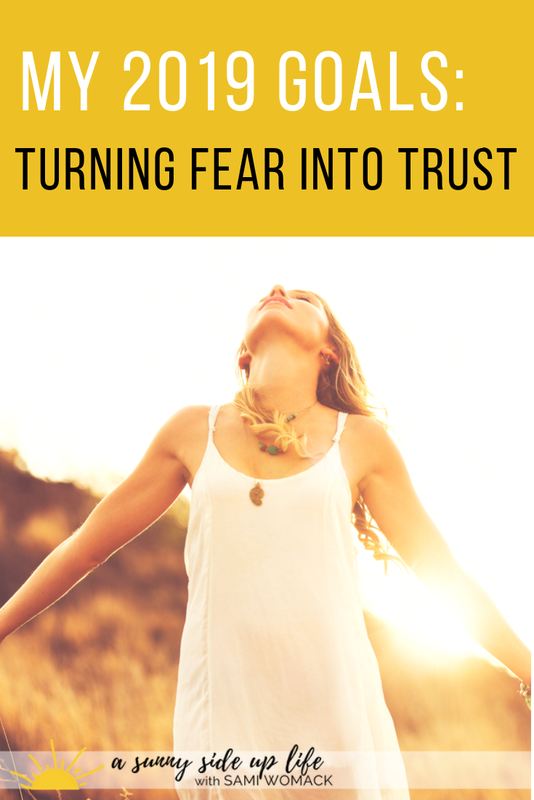 This fear comes from a place of self-doubt + a lack of worthiness. This fear comes from a lack of trust in others + a need to “always” be in control of every detail of my life. When I’m at the end of my life I want to have chased my dreams + have no regrets. I want to know that I lived a life of true success, which to me is defined as having lived in peace + joy, with a strong marriage, happy kids, an identity of my own, + with secure finances. And, at the end of this year, I know that I will be one step closer to my version of success. I know that I will have cultivated what matters most in my life. I know that I will have made imperfect progress…because hey, I’m only human. I know that I will have grown in my personal life, my family life, + my work life. And most of all I know that I will not have wasted an entire year just waiting + wishing, instead I will look back on a year of growth + I will remember my Year of Trust! Ready to get serious about your own goals? 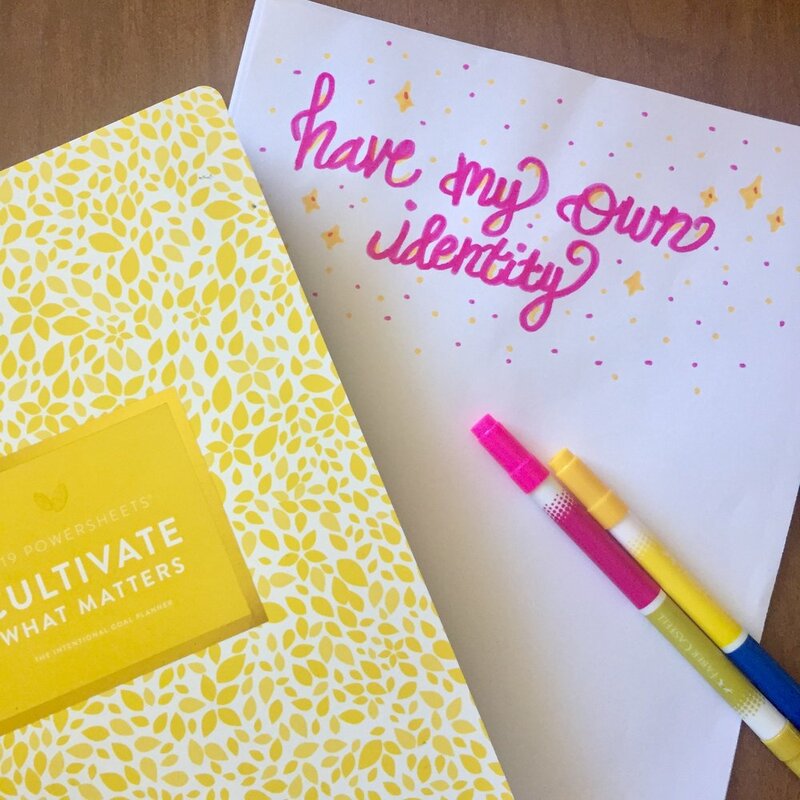 Grab a set of Powersheets for yourself + start cultivating what matters! Put this in your budget friends + don't miss out!